Clear Nail Polish can be used to seal troughs and boats (go to PELCO® Glass Knife Boats) or tape boats for sectioning with a clean, clear edge. Clear Nail Polish can be utilized for securing eyelashes or fine hair to a wooden stick for section manipulation. The clear coating provides a universal sealant of coverslips to microscope slides for permanent storage. Black Nail Polish is used to attach and seal troughs and boats (go to PELCO® Glass Knife Boats) or tape boats for sectioning. The nonreflective background provides easy visibility, and the stickiness provides complete sealing and no interference in sectioning after it dries. Black Nail Polish also offers the ability to secure eyelashes or fine hair to wooden sticks for section manipulation. Plastic cylinders for attaching pyramid-tips (from molds 10585 and 10586). 8mm diameter x 13mm length. Smooth ends for easy attachment. Lucite. 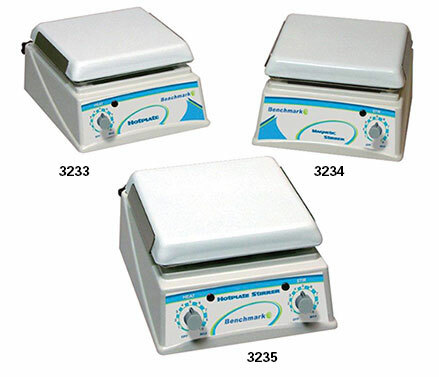 Benchmark hot plates, magnetic stirrers and hot plate-stirrers feature an exceptionally durable, chemical resistant white ceramic work surface. Their space-efficient design (20.3 x 22.9cm [8" x 9"] footprint), makes them ideal for use on crowded benchtops and inside of bio-hoods. Advanced microprocessor controls with convenient turn knobs allow quick, precise adjustment and maintenance of speed and temperature. Safety indicator LED's on the front panel indicate when the heating and / or stirring functions have been activated. Bodies are sturdy, powder coated, cast aluminum construction. With a square 19cm (7.5") work surface, all three models are compatible with a wide variety of popular sizes of borosilicate glass beakers, flasks, bottles and other vessels. The Hot Plate Magnetic Stirrer, Prod. No. 3235, comes complete with a support rod for mounting thermometers and temperature probes. Note: Stir Bars must be ordered separately, see ordering information below. Cavex Set Up Regular with a melting point of 58° C (136° F). 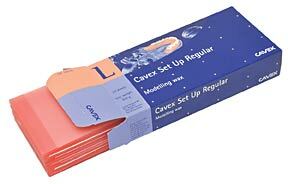 Cavex has excellent sealing properties and is a well known and worldwide recognized brand for dental applications. Pink in color. Box with 23 sheets 189 x 78 x 1.63mm thick (7-7/6 x 3-1/16 x .064 thick), 500g (1.1 lb.). Extra Tough which is slightly firmer than Cavex. 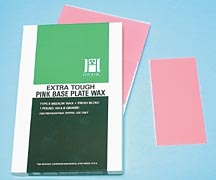 Also pink in color, box of 454g (1 lb.). Used to keep thin sections cut with an ultramicrotome in a neat row. Apply a thin layer of Tackiwax to the sides of the block face at top and bottom of trapezoid. 10g. 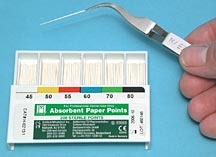 Wicking Paper Points let you aim accurately at a drop or wet area on a specimen block face. No random fibers to obstruct or damage the specimen. The Paper Point can be grasped in a tweezer. Set 115-18 contains a total of 200 Paper Points divided among sizes 15, 20, 25, 30, 35, and 40. Set 115-19 contains a total of 200 Paper Points divided among sizes 45, 50, 55, 60, 70, 80.